Bossy Italian Wife : Holy Christmas Cookies, Batman! Don't be misled. This post has nothing to do with Batman. But I felt like I needed to get the seriousness of the post and the awesomeness of the cookies across by using Batman's name. Let's take a moment to discuss my holiday spirit--it's abounding. I hope you find it contagious. 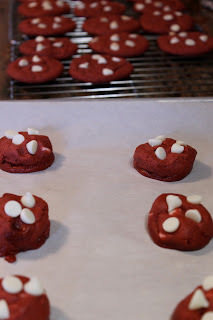 As part of said affliction, I have been scanning Pinterest for awesome Christmas cookies to bake. In my search, I found these. I mean, I sort of feel like they baited me. It's red velvet for gosh sakes! Anything with the words "red velvet" catches my attention... but these also said, "white chocolate." I died a little -- the sweet kind of death --when I heard these phrases together and I knew I had to have them for my own. I was so excited. Not only was this recipe totally and utterly awesome, but they were devoured in record time as well... which of course means that I will be making more. I only made one change to the recipe and that was that I used 1/2 cup of brown sugar in place of the white sugar. And it wasn't 'cause I was being all like, "oooo let me change this recipe" it was more because I ran out of white sugar. This was the point at which I started taking pictures. So, the secret to making these cookies look super fly, (besides the red food coloring of course) is mixing some of the chips into the batter and then PLACING the chips in the top of the individually rolled cookies. Once they started coming out of the oven, my friend Paul started testing them for me. He really loved them. He was incredulous that I wasn't tasting them straight out of the oven. That was when I had to explain to him that I had eaten a ton of the dough. I have an addiction to cookie dough. Seriously?! How good do these cookies look?!?! Just one more look. Note: Christmas themed plate. Every house needs at least one. 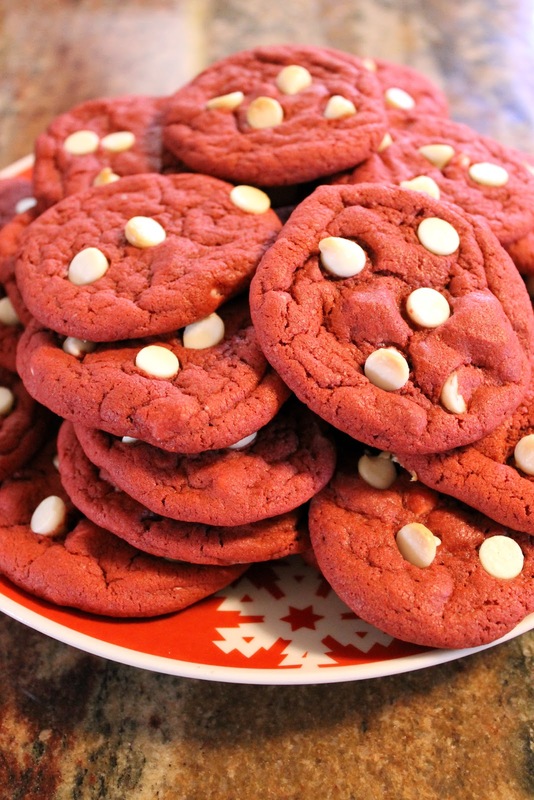 On a serious note, you need to make these cookies. CLICK HERE to get the awesome recipe.